Glenavon and Portadown meet in the first derby of the season on Tuesday night at Shamrock Park. The first Mid Ulster derby of the season takes place at Shamrock Park on Tuesday night, but a trip to newly promoted Carrick Rangers awaits Glenavon on Saturday. Carrick have certainly taken to life in the Premiership with only three defeats from seven games and they are just two points adrift of the Lurgan Blues. “I’m not surprised at all by their results,” says manager Gary Hamilton. “They have won at Dungannon and they won at Ballinamallard last week so we know we cannot drop our performance levels. Tuesday night then sees the first derby clash and manger Hamilton is hoping the match does not provide a platform for Portadown to kick-start their season. 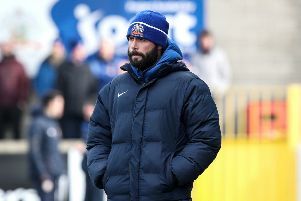 “Going by Portadown’s form this is a chance for them to kick-start their season, but we can hopefully not allow them to do that,” said Hamilton. “We have had some tight games with them recently. When it comes to a derby you don’t really need to motivate the players - they are all looking forward to it. Tuesday’s game kicks-off at 7.45pm.